Come join the folks at the hatchery for some refreshments, tour of the hatchery and the Rubber Whale Race! Live music with local band The Bottom Feeders Come fill your belly with loving spoonfuls of fresh seafood chowders stirred up by the chefs of your favourite local restaurants. Join Roy at his gallery for a rare opportunity to listen to his shared tales of life on the Northwest Coast. Come visit a traditional whale watching station along the coast with biologist, professional nature interpreter and former Chief Naturalist of the Pacific Rim National Park, Bill McIntyre. Musical Entertainment with Jennifer Lauren On her debut CD tour, Passing Perceptions. Calling all Kids! Come down and explore the beautiful grounds and rocky beach for the first ever Terrace Beach Kid's Whaler's Search. The award winning Aqua Van makes a splash with live animals from marine and freshwater habitats of bc. Kid's Whale Program 'Migration of the Gray Whales: Discover their 'sens-ational' journey!' Interpretive program for kids (suggested age 6+). Bring a shirt and come stamp some whales! Using a stencil, turn your T-shirt into an underwater work of art! A special biologist will join you on the tour to answer questions about the area and help you identify marine habitat. Listen and learn about Lisa's own experiences with seaweed and take home some of her special "made with love" sobo seaweed recipes. This video traces the entire hydrological cycle, using a mix of computer generated graphics and filmed. Let the elders of Ucluelet guide you through the complex phonology of Nuu-Chah-nulth using sound and visuals. At the Martini Migration, local businesses will compete for the coveted title of the best winning Whale Festival Martini. Explore the beach with an interpreter from the Raincoast Interpretive Centre. Fun games and activities for kids and parents too! Marine curious kids of all ages will learn and experience the wonderful world of whales! Tofino photographer and author Jacqueline Windh will give a slideshow and readings from her book. The beloved Barnacle Bash is back with special folk star Valdy! Explore the rainforest with an interpreter. What are the ingredients of a temperate rainforest? Learn to identify some common tree species. Organize a jumbled set of real whale bones to articulate them into a complete, 28-foot, juvenile gray whale skeleton! Join First Nations artist Mary Martin and learn about the fine art of cedar weaving and the many creative uses of cedar bark. Come one, come all young mariners and join us for a fun filled maritime day. Have you ever built a wooden sailboat? Tied a sailors knot? Touched a sea star? Jacqueline Windh Book Signing and q&a period for her book. Visual artist and musician, Bill Wallace, is the founder and director of swarm will be bringing an assortment of instruments for kids to bang around, clang and boom! There are prizes to be won for best costume & best float! Begins at Wickaninnish Community School travel down Gibson street to 4th, up Campbell St back at the Wickaninnish School. Special select handmades & homemades - Come meet and support the region's local artists and entrepreneurs. Paint a Whale: Bring a shirt and come stamp some whales! Learn about Invertebrates of Barkley Sound with Jim Shinkewinski. Get your teams and raft ready for this one! Tla-o-qui-aht artist Mary Martin will host a slide show and talk focused on traditional cedar works. The extreme percussion orchestra, presents theatrical shows of invented instruments, original music, comedic vignettes and intense physical choreography. Closing Ceremonies celebrated with a local Nuu-chah-nulth Bannock & Salmon bbq! 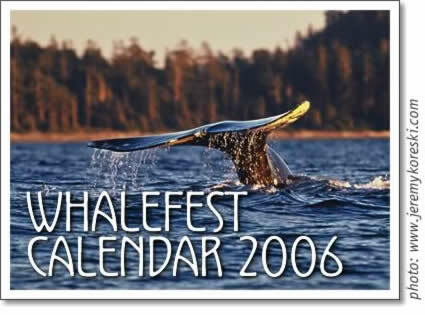 Join us in our sad farewell to the wonderful week of whale festival activities.